Lycabettus Hill is the highest point in Athens, rising 277 meters above the city placed in the heart of the city of Athens. Due to its height, it is a landmark visible from almost every part of the capital. At the top of the hill the moon shines before your eyes in the Athenian sky, awakening the most romantic feelings. The beautiful sights of Acropolis, Piraeus and the Saronic Gulf offer the visitor a magnificent view. In addition our guests are given the option of a telescopic view where on clear days you can see the ships in the port of Piraeus, the Aegean Sea and the islands. At the peak of Lycabettus Hill lays proudly the church of St. George. Its simple and overwhelming construction was built in the 19th century, contributing to the romantic atmosphere that prevails. Here you will have the best panoramic breathtaking view of Athens, from the highest possible point. The name Lycabettus reflects a popular belief that the hill was inhabited by wolves. 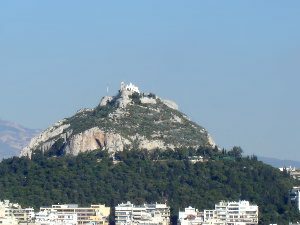 Another legend explains that Lycabettus Hill appeared when Athena accidentally dropped a large rock she was going to use for the construction of the Acropolis. Despite these interesting legends, Lycabettus did not attract the attention of classical authors and historians. However, the majestic peak is an important tourist destination. We recommend that you take the cable car railway to and from the hill. The starting point is at the end of Aristippou Street in Kolonaki and in order to serve the needs of our customers in the summer, the most touristic period, it is open till midnight. The route is short and pleasant. Of course if you want you may take the more traditional route using the stairs round the mountain enjoying a beautiful walk among the pine trees and dense flora. However, keep in mind that it might be quite exhausting on long hot summer’s nights.